Home > Resources > Blog > bows, Rehair, Repair > How often should I rehair my bow? The schedule for routine bow maintenance is poorly understood by the very players who need it the most. In addition to the hair actually wearing out, the process of the hair stretching and changing the length can throw off the balance of the bow leading to poor or unexpected performance. The scene is a familiar one in so many ways. The nervous child trying not to upset their parents and wondering if they have done something wrong, the parent wondering if they have been taken advantage of because they spent a lot of money on a bow that’s not working anymore. I smile and pick up the bow, holding it horizontally with the frog facing up. The hair hangs in a long sloping arc below the camber of the stick, dipping down to at least an inch and a half. A hank of bow hair has about 120 hours of useful life in it before the natural friction slowly becomes replaced by the stickiness of the rosin. At that point, the player starts to notice they must rosin their bow every time or seems to lose its grip and skates about. This means the only thing making the hair work is the rosin. This also starts the process of accumulating rosin buildup on the front of the instrument. The hair stretching out while you play, or even while it’s stored under tension, is another process that changes the performance quality of the bow. The center of gravity of the bow can shift as much as a centimeter just because the hair has stretched out and become too long. To be clear, if your bow is not well-maintained with fresh hair and at the correct length, all the extra money that you paid to buy a fine instrument and bow will be wasted. 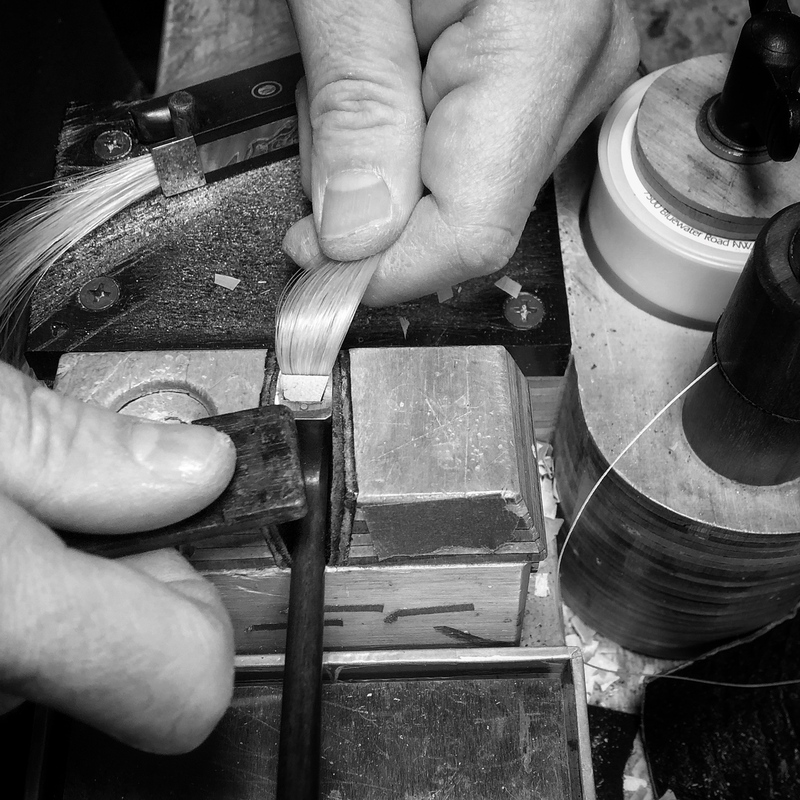 At Potter Violins we have full-time bow restorers that will be glad to work with all your bow’s needs. You can call to make an appointment or leave your bow with us. For further instrument care, you may refer to our instrument care guide. Additionally, take a look at these facts about horsehair!